The Tenpack Pickup Front attachment is designed to be attached to the front of any Steffen Systems small bale accumulator. Once the Tenpack Pickup Front attachment is secured to the front of the accumulator and the draw bar is tightly bolted into the correct position and your hydraulic hoses attached, the accumulator is ready to go to work as a machine that can now accumulate bales from behind multiple balers. The hydraulic motor on the pickup front ensures smooth and continuous feed motion into the accumulator as the operator drives through the field picking up bales. 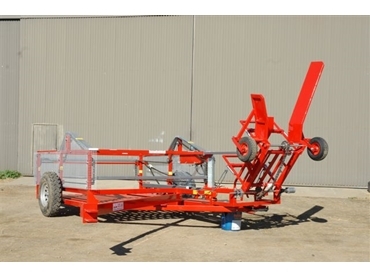 The Tenpack Pickup Front attachment is a robustly constructed attachment that has been designed to give the operator a bird’s eye view of the bales as they picked up and accumulated. Transporting the Tenpack Pickup Front attachment is made easy whilst still attached to the accumulator by simply lifting the front until the transport arm bolts into place and the draw bar is split and rotated to centre the pull.